As of 5 am, the center of Hurricane Florence is located approximately 185 miles due southeast of Emerald Isle. The Category 2 storm currently has maximum winds of 110 mph and is moving northwest at 15 mph. Winds in Emerald Isle are currently 15 mph +/-, and rainfall has not yet begun. Florence is currently forecast to make landfall near Wrightsville Beach tomorrow morning around 5 am with winds of 105 mph, which means Emerald Isle would be in the most dangerous northeast quadrant. 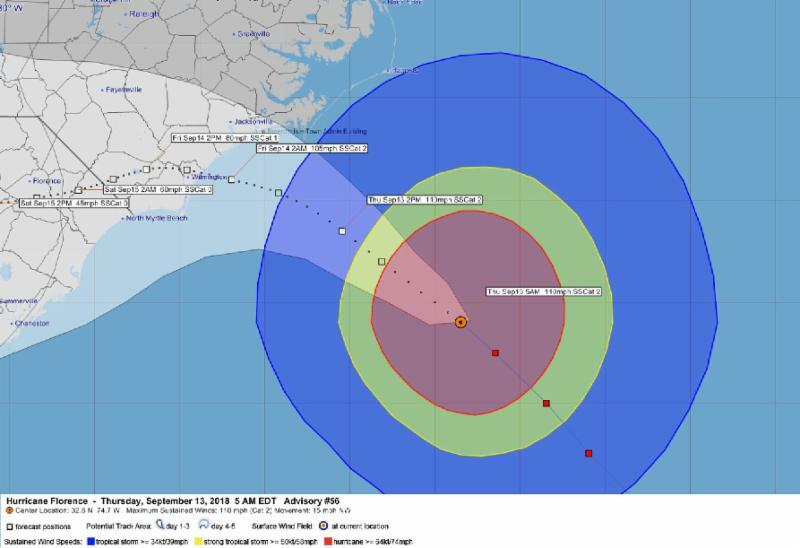 The eye of Florence is currently forecast to pass approximately 40 miles due south of Emerald Isle at approximately 9 pm Thursday. Tropical storm force winds are expected to begin in Emerald Isle by mid-morning, and continue into early Saturday morning. Hurricane force winds are expected to begin in Emerald Isle late this afternoon, and continue into late Friday morning. Significant wind, storm surge, and rainfall are expected in Emerald Isle, and the initial rain bands are closing in on Emerald Isle. Hurricane force winds, storm surge of up to 13 feet, and rainfall totals up to 30 inches are forecast, and specific impacts will depend on exactly where Florence makes landfall, where it goes after, and how fast it moves. Florence is expected to slow down and continue to impact Emerald Isle all day Friday and into Saturday. Due to the significant danger posed by Florence, Emerald Isle will be under a curfew beginning at 7 am this morning. The Emerald Isle bridge will be closed at that time. No one will be allowed to enter Emerald Isle after 7 am today until further notice.